In the previous article in this series on using Seattle Airport (SEA), I discussed the pieces to consider when doing the analysis to see whether it makes sense to fly out of Vancouver (YVR) or Seattle (SEA). In this article, I’ll go through a few examples to see when it does and doesn’t make sense to make the trip to Seattle. These examples assume you live and work in the Vancouver area and your home airport in Vancouver. You can do a similar analysis for yourself if you live on Vancouver Island. There will be other factors that determine your preferred airport to fly from, but we will discuss time and dollar costs in the examples here. Let’s say that you wanted to visit New York for the week of Spring Break. There are 4 of you going and you want to make sure to get a few days in New York but are flexible enough within a few days. 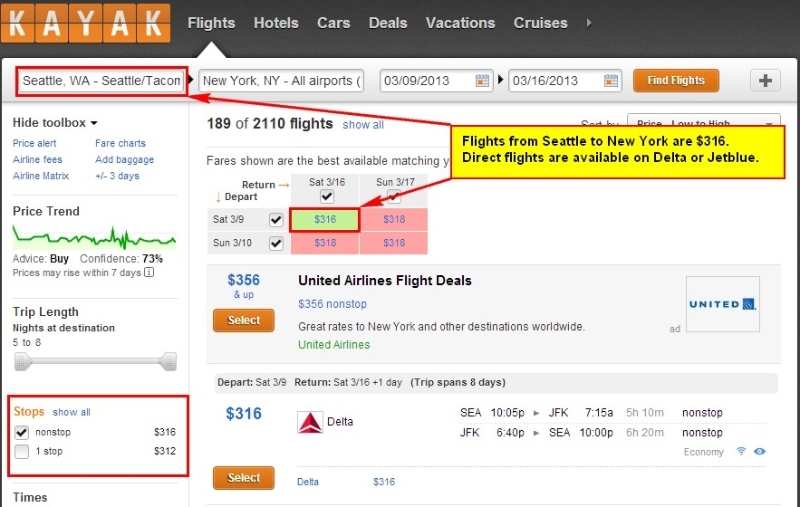 In this example, the flights from Seattle are coming in at around $316 vs $664 for the flights from Vancouver. In this case, there are direct flights on both routes so there is a definite time cost to flying out of SEA. The savings is pretty significant in this situation. You are a family of 4 and the eldest is graduating from Harvard University in Boston. The 3 of you (2 parents and the youngest) decide to take the flight over to be at the Graduation on May 11. You would like to stay a few extra days in Boston and walk the Freedom Trail. 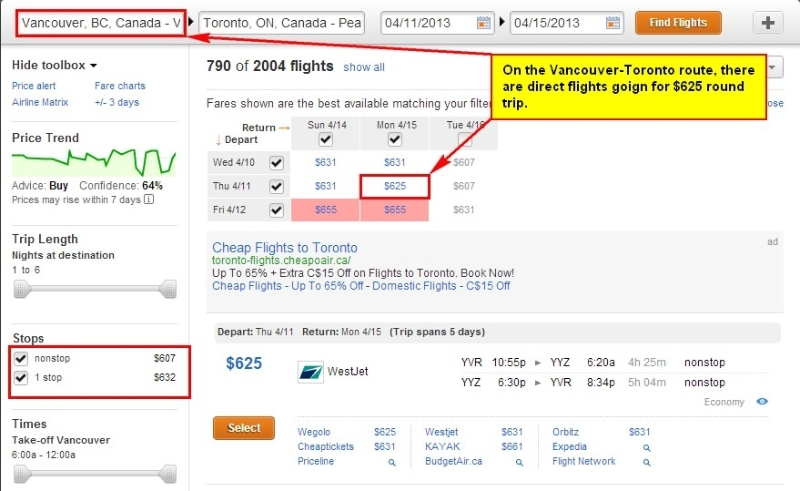 In this case, the cheapest flight out of SEA is a direct flight, while there are no direct flights from YVR. 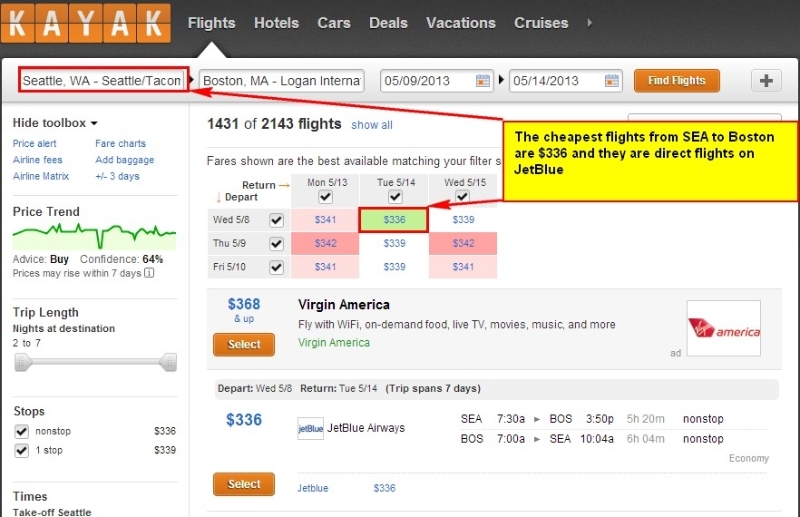 The direct flight SEA-BOS runs $336 on Jetblue (1st checked bag free) vs $563 for the 1-stop from YVR. 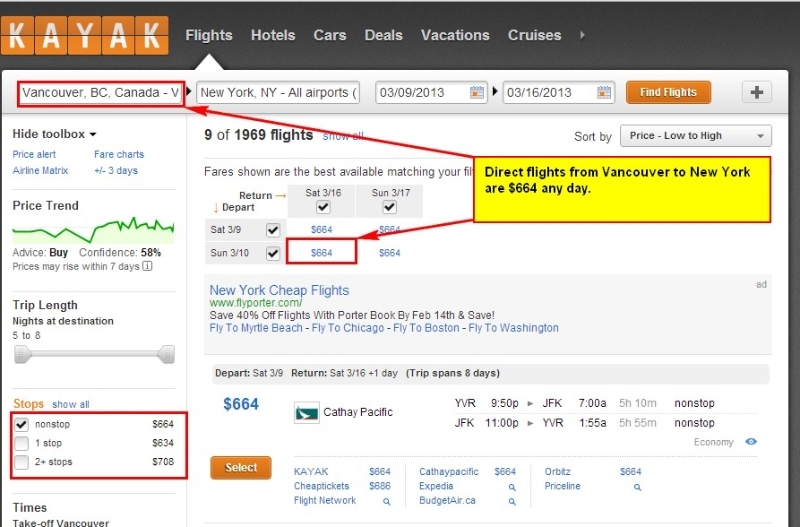 In this case, you are likley going to save significant time and money by using SEA instead of YVR. 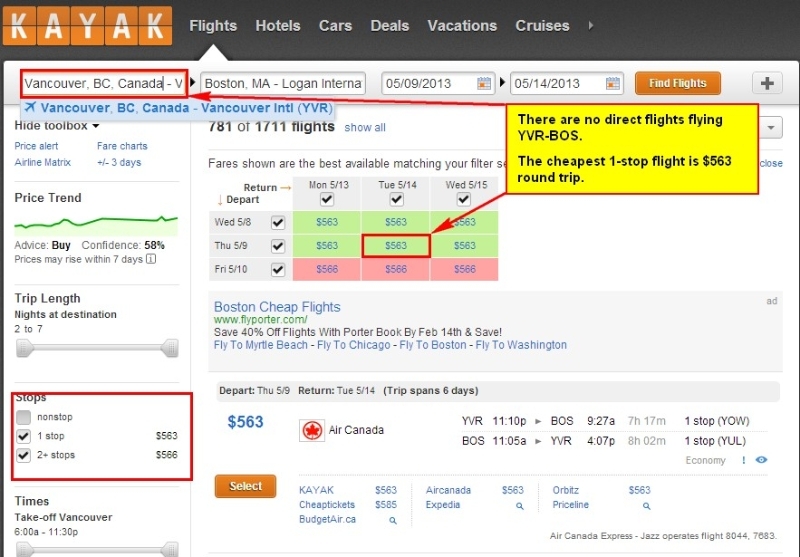 If you are looking to go to Toronto, the analysis becomes much more complicated. This is definitely one of the most traveled route in Canada. There are direct flights from both YVR and SEA into Toronto Pearson (YYZ). The 1-stop from SEA is considerably cheaper than anything on the YVR-YYZ route. If you are interested in going, there is also the consideration of Buffalo airport as and alternative to Toronto. You can have 4 permutations, and as you can guess the alternate airports of BUF and SEA are cheaper than their Canadian airports of YYZ and YVR. You can decide what your time is worth here but this shows that there are options for flying between the Vancouver area and the Toronto area. 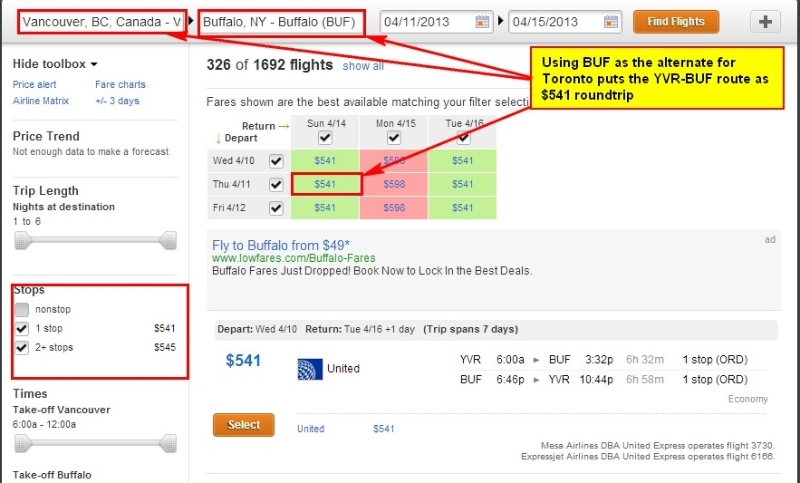 For more details on using Buffalo as an alternate airport to Toronto Pearson, please see my series on Using Buffalo Airport. 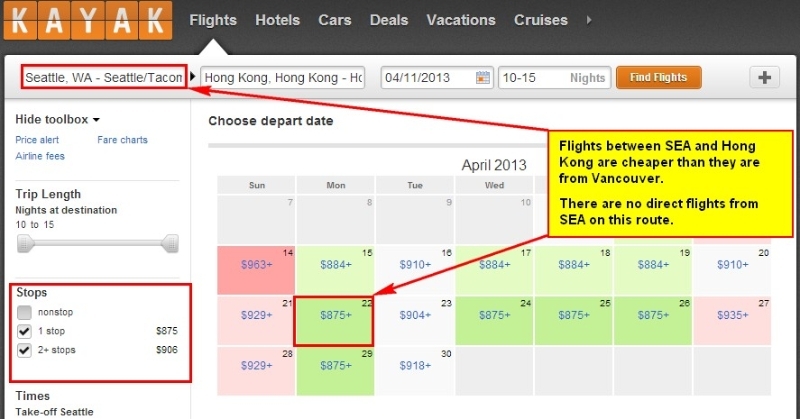 Let’s say you want to go to Hong Kong for a month in April of 2013. You have a lot of flexibility on this trip. In this situation, there are actually no direct flights out of SEA, but there are direct flights from YVR. The direct flights out of YVR are about $100 more than the 1-stop flights out of SEA, so I would think this would be a wash in terms of savings. I probably would fly out of YVR if I were in a party of 3 or less. Anything more than that I would really have to think about it. 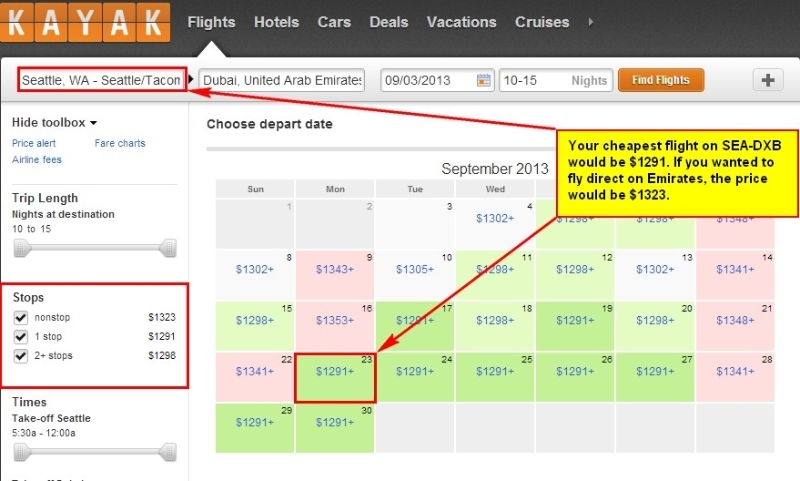 Maybe you are interested in going to Dubai in September, with a lot of flexibility. Seattle has a direct flight (on Emirates!) whereas there are no direct flights out of Vancouver. On a route like this, I think that direct flights are much more valuable in terms of time savings, but everyone will have to decide if they have more time or more money. 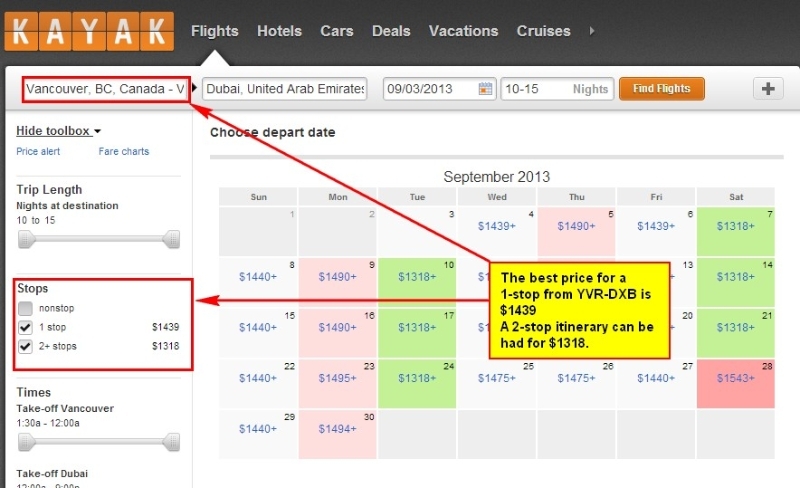 The direct flight on SEA-DXB is $1323 and the 1-stop is $1291. 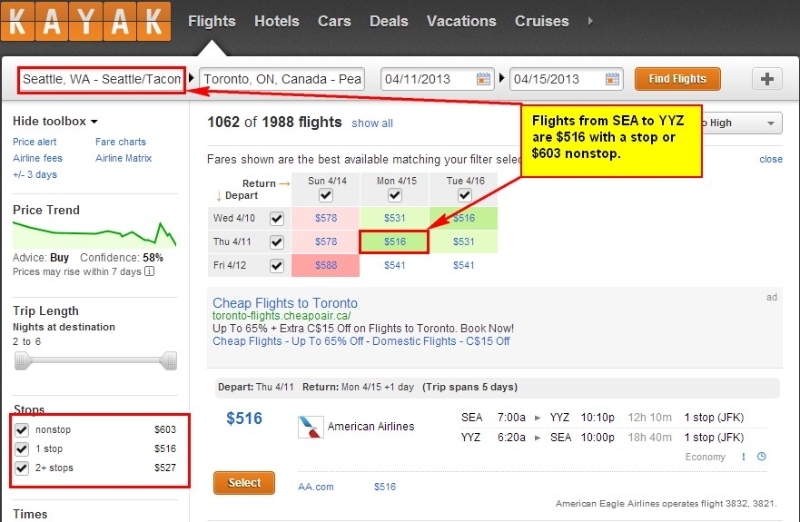 The 1-stop from Vancouver is $1439, and a 2-stop from Vancouver is $1318. As with anything, you are going to have to do the analysis of what makes sense for you. 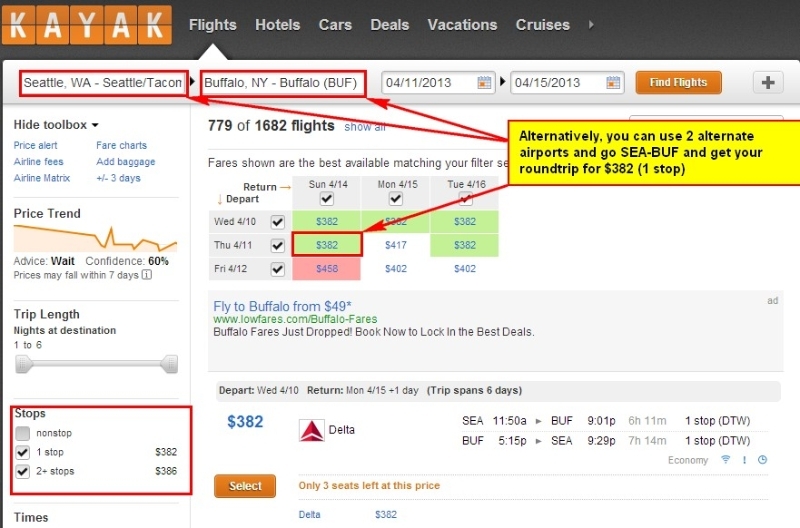 In this post I showed a few examples to illustrate the savings to be had when flying from Buffalo. For your specific In future posts, I’ll comment on the best options for getting to Buffalo Airport by car and what to do with your car when you get there. If I lived in Vancouver still, I would also think about Bellingham airport. Most definitely Bellingham is a great airport to use for Vancouverites. Bellingham is great, but doesnt compare in terms of the number of flights as Seattle does, especially if you are flying cross country. That being said, BLI is a great alternative and I would want to use that instead of YVR if I were going somewhere that is easily accessible from BLI. Don't subscribe All Replies to my comments Notify me of followup comments via e-mail. 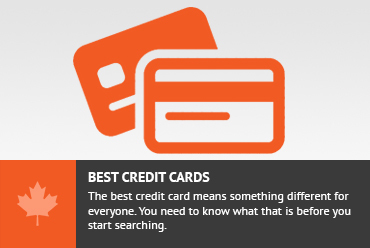 You can also <a href='https://www.creditwalk.ca/comment-subscriptions/?srp=631&srk=2648578ecea05c83754707575dc5a494&sra=s&srsrc=f'>subscribe</a> without commenting.